A movie that looks fantastic, is filled with energy, and has some pretty fantastic songs, this is the best Disney movie since Frozen. Now this is a fun movie. The plot might be simple, (free spirited girl goes on a mission to save the nature spirit by returning her heart stone,) but the humor and music go a long way. And the movie is an absolute spectacle. This is one of the best looking animated films of all time. It really captures the aesthetic and beauty of the open sea and it does that by keeping things lively and exciting. The characters are fun, and the story might be simple, but that’s not necessarily a bad thing. One mission leads to another as it’s all a part of a giant plan. What we get is a great adventure film loaded up with creatures, action scenes, and some rally powerful songs. 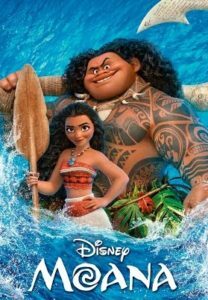 Moana is a fun Disney / Pixar film, that is all about spirits and adventure. Call it the Princess Mononoke of the tribal seas. This one takes us into the lives of a group of people who live on a Polynesian island, as a tribe that does not venture out and leave their borders. Moana is the girl who wants to go out to sea and experience the world. She’s the free spirit in a time of oppression, who just wants to get out there and explore. These themes and tropes might be usual storytelling cliches, (just think of Ariel in the Little Mermaid, Belle in Beauty and the Beast, or Jasmine in Aladdin,) but what this movie does with them is pretty unique and cool. For one, the characters who don’t want her to go out to sea are not enemy’s or villains. This isn’t Footloose or Fahrenheit 451, where free thinking is oppressed. It’s just that there’s a past here, about the way the people in her tribe once were, and the tragedies that happened to them, and let’s just say, they learned to be afraid. They are scarred by the past and looking out for Moana, when they restrict her to staying on the island. These characters want nothing more than for her to be safe and protected. There’s even a song about it with the chorus that repeats the words, “and no one leaves.” It’s not quite “Under the Sea,” about how ocean life is better than life on the surface, but it’s still pretty good. At the start of the movie we hear all about a legend. There was once a spirit of nature named Te Fiti, who formed as an island in the middle of the ocean and caused the world to bloom and grow. She used a special stone for her heart, (a Macguffin, which part of the movie will be about locating.) Then one day, a demigod, named Maui, who could shape shift and become any animal he chose, showed up. He wanted the magic of the nature spirit for himself, and being the trickster and clever one that he was, he was able to steal it. Only there was another character out there who wanted this magic even more. This was an evil volcanic demon. He attacked Maui, causing both the stone heart, and Maui’s magic fish hook to become lost. Now, years later, Moana is a little girl growing up on the island. She hears the legends. One day the stone heart arrives on the shores and comes to her, brought by the ocean. This scene, with the waves forming up all around her like something magical, is pretty cool. At one point the waves form a wall around her with animal swimming inside of it, and it’s as if Moana is standing in an aquarium. Moana grows older, and when the life on the island starts dying, (starting with some rotted coconuts,) she has the idea of taking the stone-heart and going out to sea. Moana has doubts (especially when her first attempt to sail on the waters doesn’t go so well,) but her grandmother leads her to a cave to teach Moana the truth about her people. Maui is voices by Dwayne Johnson (the Rock,) and he really delivers here. 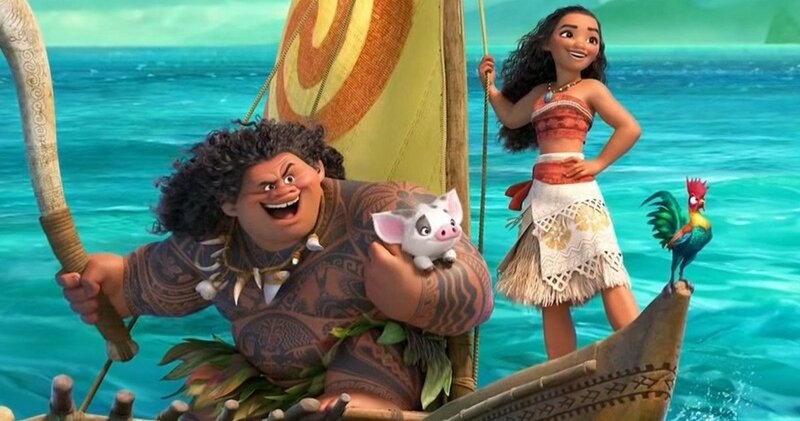 He conveys not only the humor and fun personality, but he also sings and carries some pretty good songs, (“What Csn I Say Excrot You’re Welcome?”) Moana expects Maui to be a villain. In fact, that’s one of the cool things about the story, from the very beginning. During the legend, at the opening of the film, we are presented with a story where there is a villain, (Maui,) and then an even bigger villain, (the volcano spirit.) When Moana finds Maui, he explains to her that his stealing of the heart stone was not meant to be selfish or malicious. His plans were to give it to the people of the island. And now, he and Moana team up to get it back to the Nature Spirit. Only there are a couple of things that need to happen first. Maui needs to get his fish hook back, which will give him the shape shifting powers he needs to conquer the volcano spirit. Both he and Moana also need to get passed a group of small pirates who wear coconut shells for masks. These obstacles turn out to be a lot of fun. Sometimes they move the plot forward and sometimes they don’t, but it doesn’t really seem to matter. So while the pirate creatures don’t do anything to further the storyline, for example, they do make for a pretty adorable enemy and the start of s cool action scene. And from there, the characters are headed off to find a scavenger crab. He’s the guy who collects treasures and is known as a bottom feeder. Maui knows that if anyone’s got his fish hook, it’s this guy. So he and Moana go off to find and outsmart the creature, who lives in a mountain of monsters. The crab is voice by Jermaine Clement (or Flight of the Conchords fame,) and he has a lot of fun with the role, even getting s musical number of his own. The only problem with Moana is that the plot often feels a little too convenient. Why does Moana need Maui, for example, to return the heart stone to the nature spirit? And if Maui knew that the crab was the one who had his fish hook the whole time, then what was stopping him from going after it before Moana showed up? What does he need her for? With the convenience and simplicity of some of these ideas in mind, one has to realize that sometimes it’s nice when a movie is pretty straight forward and easy to follow. This is a film with very clear and basic missions. First Moana has to find Maui, then they have to find the fish hook, and then they have to find the nature spirit and give the heart back. Being just a simple mission movie goes a long way. If only this movie gave us some brief explanations of why these characters needed each other. Still, the story aside, the film has fantastic visuals , charming songs, and some wonderful energy.